“Tinkers to Evers to Chance,” featuring James Craven and Emily Kitchens. Photo by Meghan Moore. By Mat Smart, directed by Sean Daniels. LOWELL – In baseball, there is winning and losing just as there are wins and losses in the game of life. But baseball is more than just a game here in Boston or in Chicago, where the Cubs are also akin to a religion – albeit a religion that has been looking for a savior for 108 years. 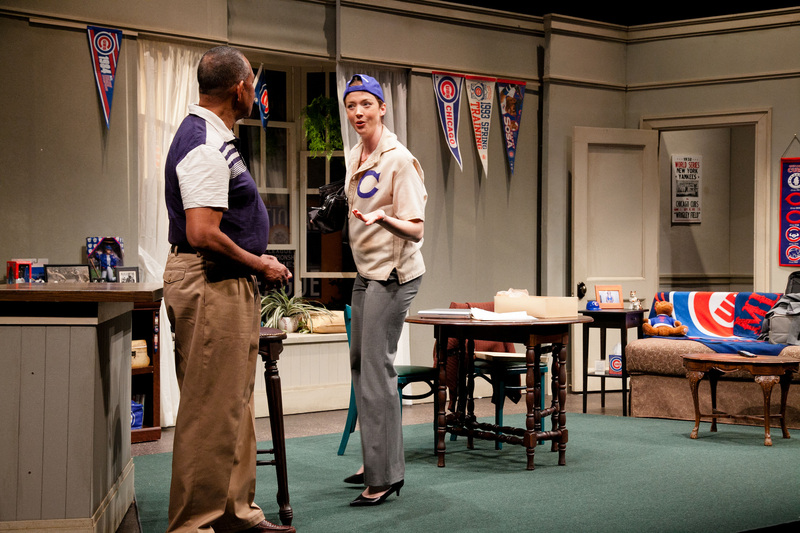 Yes, the Cubs fans are diehards, but the results of baseball games can have meaning far beyond the borders of the sport – as playright Mat Smart explains in “Tinkers to Evers to Chance,” now being performed by the Merrimack Repertory Theatre. Smart is a Chicago native and Cubs fan and the title refers to three members of a Chicago Cubs infield – scrappy infielder Johnnie Evers, part of an infield, along with shortstop Joe Tinker and first baseman Frank Chance – that became renowned for their ability to turn double plays in the early 20th Century, a time when the Chicago Cubs ruled the baseball world, with four appearances in the World Series and two championships. The three were memorialized forever in a ditty called “Baseball’s Sad Lexicon” by Franklin Pierce Adams. 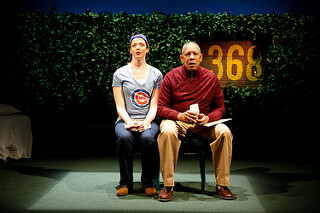 “Tinker to Evers to Chance” at MRT Featuring James Craven and Emily Kitchens. Photos by Meghan Moore. By Mat Smart, directed by Sean Daniels. Against this backdrop Smart brings us Lauren ( Emily Kitchens), a young professional who has moved to New York City and returns infrequently to see her mother Vanessa in Chicago. On this day, Oct. 14, 2003, she has arrived with bells on, set to watch with her mother the Cubs, who have a chance to beat the Miami Marlins and make it to the World Series for the first time since 1945. But when she enters her mother’s apartment hard by Wrigley Field, she is greeted only by RJ (James Craven), the personal care assistant who has been helping her mother since a stroke on the right side of the body disabled her. While RJ claims to know nothing about where Nessa, as she is called, has gone, he knows that she may have left clues behind in the form of a play she has written and RJ has been typing, a play about the tragic story of Evers’ life after baseball and the family’s obsession with him. Lauren has decided to attend the game wearing her prized possession: an actual Cubs game jersey once worn by Johnnie Evers,who is actually a namesake of sorts, since her actual name is Everly Lauren. Lauren will spend the entire game – perhaps the lowest of low points in the Cubs’ tragi-comic history, known for fan Steve Bartman interfering with a pop-up that may have changed the outcome – unsuccessfully searching for her mother, who never showed up for the game. In the play written by Nessie, who will inject herself into it, the action will move back and forth between the present and the first meeting of Lauren’s grandmother and Evers at a South Side drug store, not long after the Cubs’ crushing defeat in the 1906 World Series, and span 97 years in all. The most powerful, poignant moments have the 17-year-old Nessa, armed with the prized shirt her mother received from Evers, traveling from Chicago to visit the stroke-crippled Evers, whiling away the days before his early death in Albany, N.Y. So when Nessa writes about Evers’ feelings for his nurse, is she really writing about her feelings for RJ, who has been a widower for many years? Craven’s RJ is dignified and proud, and both he and Kitchens show some spot-on comic timing in populating several of the characters in Nessa’s play-within-a-play, with both taking on several cross-gender roles. “Tinker to Evers to Chance” is directed by the MRT’s artistic director, Sean Daniels, who also directed the play during its world premiere run at the Geva Theatre in Rochester, N.Y. 2014 and has reunited the original cast and designers for this run. The comfort level among director, cast and designers shows itself during the second at-bat for the piece, if you will. The play should ring true to those Red Sox fans whose loved ones couldn’t hang on long enough to see Boston win it all in 2004, or for those for whom loss and loneliness are a daily companion. The Merrimack Repertory Theatre’s production of Mat Smart’s “ Tinker to Evers to Chance.” Directed by Sean Daniels. Scenic design by Randall Parsons. Costume design by A. Lee Vileisis. Lighting design by Brian J. Lillenthal. Sound design by Stowe Wilson. At the Nancy L. Donahue Theatre at Liberty Hall through March 6. www.mrt.org.